Did I miss anything Allan? It looks good, nice job! No one would ever suspect that it isn't original, except that an original one on a 46 year old car would show some signs of wear. Throw a little grease and dirt on it and you're all set! Looks great. You have a PM. I don’t know if making that sticker will get you in trouble with DMV. Not a chance. DMV is only concerned with the VIN, and most of them have a hard time wrapping their heads around a 13 digit VIN instead of 17. The VIN on this sticker matches the VIN on the OPs car so what's the big deal? Actually, it CAN be a big deal. States now often require seeing the VIN it TWO locations. The one on the dash isn't enough. The one on the door edge, such as the one the OP just made, and which is often also called the "Nader" sticker (as in Ralph Nader) is often used as the second VIN source. When I registered my '78 Toro here in New Mexico in March of last year, the VIN inspector looked at both the dash VIN and the door VIN before he would approve a new title. This can be a problem for older cars if that door sticker has fallen off or was removed in a repaint. 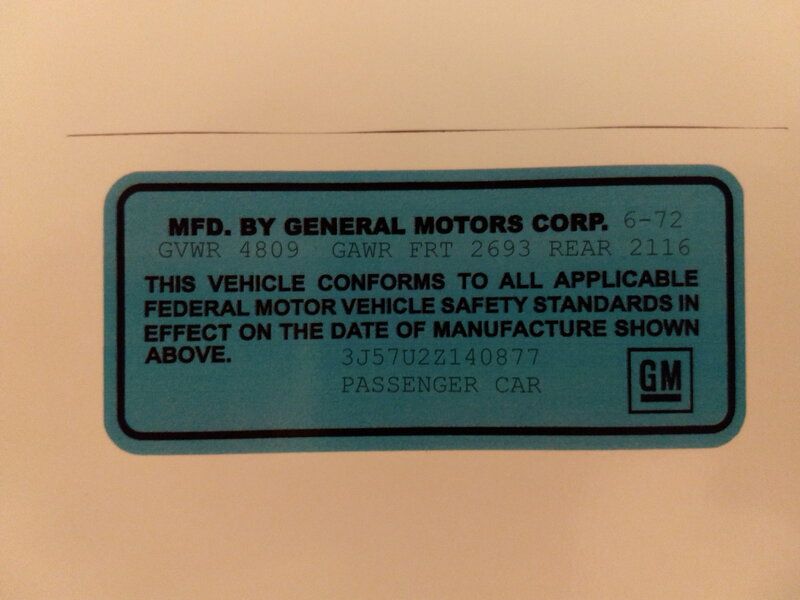 I had a harder time getting my '67 Delta registered here until he finally looked up models that old and discovered that there are no other VIN stampings, including no door sticker. I don't know how the rules are in Canada, but in the U.S., yes, having that sticker can be a life-saver at car-titling time. As far as Fpcopo's point, he raises a good one. It depends, I think, on just how hard a DMV inspector looks at that sticker. He may not realize that it's a reproduction, and, if the owner doesn't say anything, he might get away with it. They only do the VIN inspection when the car titled, not every year at registration renewal time. But it may very well now be against the law to tamper with that sticker. On a car as old as we're talking about, though, this may not apply. If it's such a big deal with reproducing that door sticker, why are they sold on the web for owners to add to their rides. Seems to me your DMV is targeting the wrong issues. The OP already has his car registered but I have no idea if his state DMV even looked at the door for a sticker. They were probably confused to try and figure out why it only had 13 digits. The door sticker on my car is a reproduction done by a member on this site (can't remember who it is now) and he did a spot on job of reproducing what the cars original would have looked like. The original was unfortunately lost in a re-paint. Last edited by Allan R; October 2nd, 2018 at 12:00 PM. If it's such a big deal with reproducing that door sticker, why are they sold on the web for owners to add to their rides. Because people do illegal things. Shocking, I know. Seems to me your DMV is targeting the wrong issues. Maybe so, but what the DMV targets ain't up to me. They say it's to combat vehicle theft as the dash VIN plate can be changed or modified. So can a door sticker, of course, but you have to start somewhere. Yes, he does, so this isn't an issue for him. But it could be for the next person to own the car if he ever sells it. They were probably confused to try and figure out why it only had 13 digits. I have not run into this problem at any time in registering any of the old cars I have owned over the years. I think DMV offices realize that pre-1981 cars have 13-character VINs, and there's enough of these cars running around that they see one often enough to be reminded of it. The particular 22-year-old who is working to title your car may not know it, but, in my experience, it has never taken long for him to check with someone else at the DMV office and get brought up to speed. When I registered my out of state vehicle in California the DMV wouldn’t pass it because it was missing the door vin. I had to go to the highway patrol to have them verify it. All they did was checked my body tag on my cowl, which doesn’t have a vin then they approved it. I think if I had a reproduction sticker the DMV would have passed it. Wow...I had no idea my thread would cause such a commotion. All I wanted to do was share my achievement and bring back some originality. (As mentioned above, my original as also destroyed in a repaint). But controversy aside, I can tell you that the DMV here in SE VA didn't give it a second thought when I got my registration and title. I live in Nebraska. It used to be very easy to get a car titled but now they have gone the other way. In March I bought a 66 442 from Texas. The sheriff that inspected the car asked me where the hidden VIN was. Thankfully I had looked for it and found it on the frame so I was able to tell him where it was. The door tag was not enough. 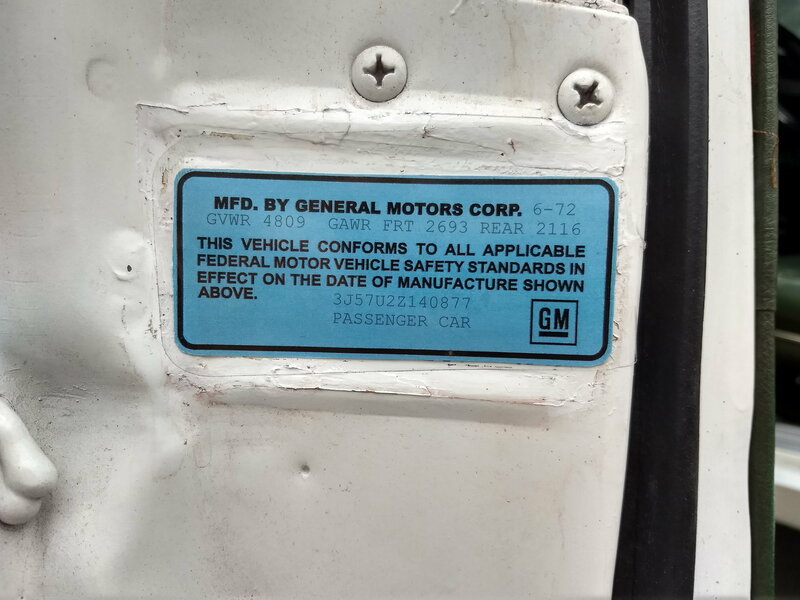 My point in the first post was exactly what was just said, if the guy inspecting the car has any suspicion that this sticker was replaced, I.e., too nice looking, he will refuse to sign off on it. This won’t be a problem for the original poster but maybe to the person he sells it too. It’s a problem because if someone restores a car or even has a nice paint job with clean painted door jambs, he is not going to leave a tattered sticker on it. If it was mine, I would probably do the same thing. All I wanted to do was share my achievement and bring back some originality. And potentially commit a crime in the process! Isn't life fun? Ok...so we all know the VIN is on the dash, right? Suppose for whatever reason the VIN sticker has gone the way of the dodo, and the owner decides not to throw on a repop sticker. If said car has a numbers matching drivetrain, would that not be enough to satisfy the need of a second VIN? If said car has a numbers matching drivetrain, would that not be enough to satisfy the need of a second VIN? No, because the "numbers matching" is not a complete VIN. It's a VIN derivative, which has the division, assembly plant, model year, and the last six digits of the actual VIN (the numbers that actually "match"), but it doesn't have all 13 characters (no series or body style info). The DMVs want to see a complete VIN. Plus, "numbers matching" only began for Oldsmobile with the 1968 model year. I think another issue for the DMV would be that, unlike the dash tag and body stamping, the engine and drivetrain can be and not uncommonly are replaced. They're not really a permanent part of the basic body and frame of the car. I agree that the door sticker is easy to replace or fake, and I'm surprised that DMVs will accept it as the second VIN. But the other locations on the frame or whatever on an older car are simply not viewable by casual inspection of the car, and it would unreasonable to ask car owners ro disassemble their car to the point that the frame stamping is visible. So I would guess that using the door sticker is sort of an uncomfortable compromise. Modern cars have the VIN in several places so this is not a problem. My '14 Mazda has it in at least four places that I've found. On the dash like you'd expect, on a sticker on the door jamb where the sticker for the tire pressures and vehicle weight information is also located, under the hood on a sticker, and, if you look under the passenger side floor mat, there is a rectangular plastic door that says "FRAME NUMBER" on it. Open that door, and the full VIN is stamped into the floor pan. This is what the DMV people see 99% of the time when they deal with titling vehicles that have changed owners, and this is why they get stomach aches when confronted with a vintage car that doesn't have all of these VIN locations. Last edited by jaunty75; September 26th, 2018 at 08:04 PM. Dan, the 'other locations' on the frame are only VIN derivatives too. There's only one real fixed VIN on the car and that's the one on the front of the dash. Stickers on new cars are not comparable to the old technology and mindset. Dan, the 'other locations' on the frame are only VIN derivatives too. Whether what's stamped in the other locations is the full VIN, a VIN derivative, or my mother's recipe for chocolate chip cookies, the point is that the DMVs now accept it as a verification of the VIN. No DMV person who has looked at my cars has ever said that anything other than a second VIN is needed. They've never said a derivative or subset or whatever phrase you want to use is acceptable. Now maybe they don't know the difference, I don't know. This gets back to the point, though, about VIN derivatives on the engine and drivetrain and why those don't appear to be acceptable to the DMV while something stamped into the frame apparently is. The car's frame stays with the car, while the engine and transmission can be removed. Also, as I noted above, my 2014 Mazda has at least two fixed VIN locations, the dash and the one under the passenger side floor mat. The latter is right in the metal of the floor, not attached to something, like a sticker or a piece of metal, attached to the floor. when i tried to title an 03 chevy van from out of state the sheriff had to verify the vin.he said it had to have 3 or no go.the dash the drivers door and the option line sheet,which happened to be on the pass side door.so if either door had been changed i would have been screwed. FWIW, ESC reproduces the subject label, adds the car specific information, and includes the correct clear overlay. Wow, those reproductions are extremely expensive. That's to pay the bail bondsman. 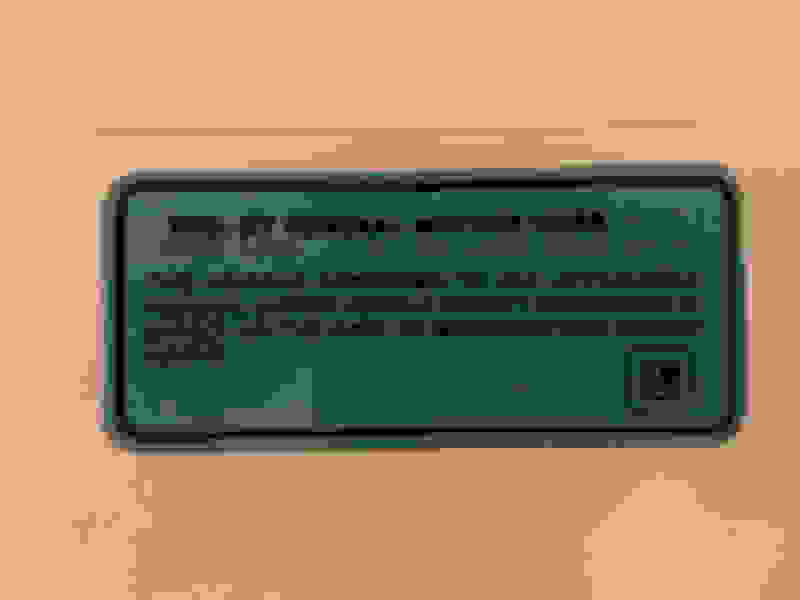 But it appears that they require a clear photograph of the original sticker. That's fine if it's still on your car. But what if you have a car that doesn't have its old sticker, such as one you might have just bought from a private seller who had the car repainted at some point and the sticker was not kept or replaced? The OP of this thread was trying to create a sticker from scratch.